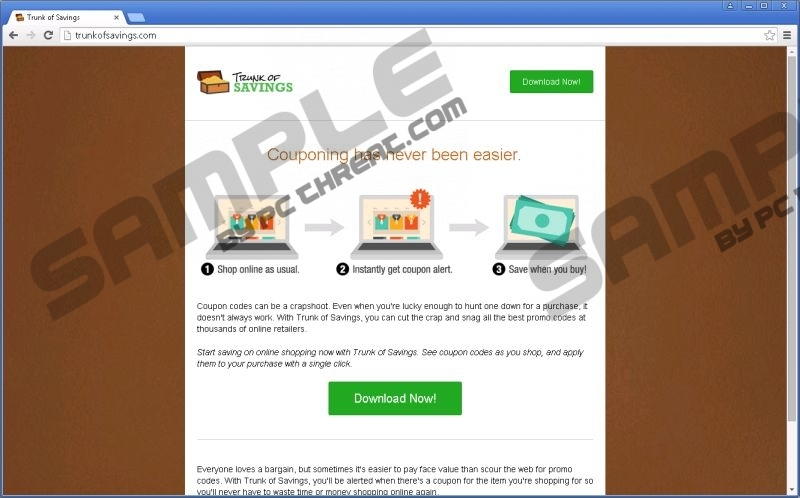 Trunk Of Savings will soon hit the World Wide Web, but there is nothing to be excited about, because it is adware program that you should remove if you were to get it. At present, not much is known about it, but from the get-go we want to inform PC users around the world that it will not improve your browsing experience in any shape or form. We have gathered as much information about it as possible that should help you avoid and remove it if necessary. Because, Trunk Of Savings's advertisements will not only hamper your browsing experience, but will also put your computer in harm’s way as some its advertisements are bound to come from unreliable sources. This program is undoubtedly malicious. We have recently encountered several of its clones that are called BrowserWatchdog, Ninja Savings, PriceChomper, and DealBarium. All of the aforesaid programs were developed by the same developer. However, to this day, this developer remains a secret. Its programs provide not information about it which makes it difficult to link all of them. Nevertheless, this developer sets up promotional websites even before the actual program is released. In this case, Trunk Of Savings is promoted on a website called Trunkofsavings.com. Its website already includes a download button, but it does not work, and thankfully you cannot get it from its website. However, when it is released it will definitely be bundled with free software that is featured on borderline software hosting websites. Therefore, you should always try opting for custom installation as opposed to standard/express installation settings whenever you download software not from its dedicated website. Trunkofsavings.com contains a lot of useful information about this program. You can forget about Trunk Of Savings offering you coupon codes that you can actually use. The only thing it will offer you is annoying third-party advertisements that do not come from legitimate online retailers. If you read the End User License Agreement you will get a glimpse of things to come. It states that you will be subjected to sponsored links that can appear as part of your search results on Google.com or Bing.com. It will also show you pop-unders, banners, coupons, and even video ads. So this program has no shortage of advertising techniques. You might think that the ads are legitimate and pay a hefty price for it, because such programs are usually used by unreliable advertisers to advance a certain agenda, such as promoting potentially unwanted software and fictitious online retail websites. Of course, such occurrences are rare, but still plausible. So why risk your computer’s security when you can enjoy ad-free browsing. Cyber security is of utmost importance, so you should cherish and protect it by all means possible. This means practicing safe browsing habits by not visiting shady freeware hosting websites, clicking on advertisements, not opening spam email, and so on. Trunk Of Savings is only mildly malicious, so for the most part you should be warring about its annoying nature and promoting other unreliable programs. Removing Trunk Of Savings should cause any problems. We think that removing it via the Control Panel should sufficient as it is unlikely that it will have a browser extension. Identify Trunk Of Savings and click Remove. Identify Trunk Of Savings and right-click on it. Identify Trunk Of Savings and click Uninstall. Identify Trunk Of Savings and Uninstall it. Quick & tested solution for Trunk Of Savings removal.